First, a HUGE shout-out to Jill at Jogging Jeans for the fabulous dedication yesterday. Jill is one of my favorite bloggers. She is hilarious and lovingly irreverent, and definitely gets where I am coming from when it comes to running. I can’t imagine that anyone reading my blog wouldn’t have already visited hers, but if you haven’t, do it immediately. I am very excited to meet her in May at the Pittsburgh Half. You should come and join us! While I was turning many shades of red and cultivating my moose-running skills in 2012, my running buddy, a.k.a. Hubby, a.k.a. Mr. I Finished 20 Minutes Ago, a.k.a. guest blogger extraordinaire, was running 21 half-marathons. That’s right, 21. He initially committed to 12 in 2012, but got so into it that he wound up switching the digits. I think that deserves a moment, don’t you? It’s pretty good for someone who only started running (and exercising, for that matter) at the end of 2010, when he joined the Massachusetts National Guard and realized he literally needed to get up to speed for the physical fitness test. If he hadn’t caught the running bug, I never, ever would have accumulated so much Lululemon put a toe anywhere near a road race. 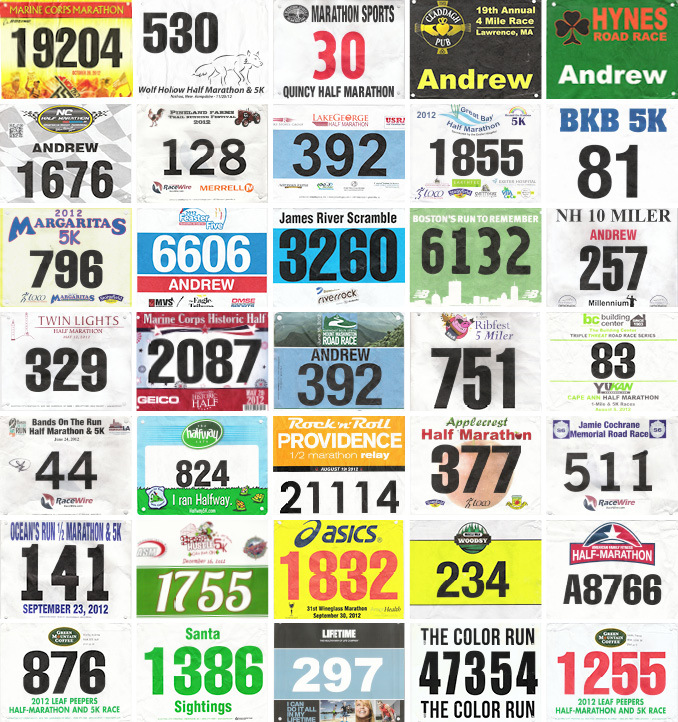 For the record, here are the 2012 half-marathons. They are all amazing races, should you feel so inclined to partake in one or two – or 21 – in 2013. The ones that are asterisked he is either already registered to run again, or they’re in his plans. Those with a double asterisk I am “running” too. This entry was posted in Fitness, Running, Sports and tagged half-marathon, Lululemon, running bibs. Bookmark the permalink. Andrew makes me feel inadequate. Hahaha Good on him though. Let’s start the pool for how many toe nails he’s going to lose in 2013. 0231? Andrew is a BEAST! What an incredible accomplishment! Tracey, do I see a 12 months, 12 half-marathon 2013? I’d love to think I could do that but I don’t believe my legs are up for it! Read: I am not good at committing to a training regimen. Read: I am lazy. 😉 So far, I’m doing three halfs and one half walk, so you never know! I like Jill’s idea of 12 months/12 halfs. Shooting for Pittsburgh in May. Have a DC trip around that time but I think it’s going to work. Fun! That would be SO fun! I hope you can swing it!! Now we just have to get Tiffany F in on the party. Wow, that is amazing! I cannot imagine doing that many long distance races in one year. Props to him! I did my first half marathon in 2009, and I’ve yet to hit the double digits! That is amazing! And I started running too when I signed up for the Air Force Reserve in 2002 and realized I would have to run two whole miles to graduate from basic.